The weatherman forecasts rain this week. 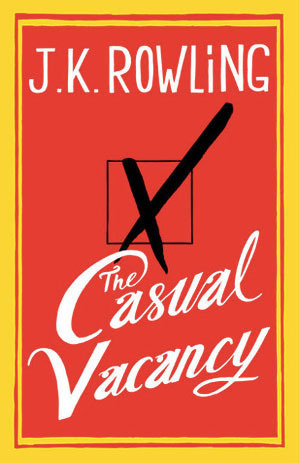 This week I’m reading The Casual Vacancy by J.K Rowling. No, it’s not about Harry Potter. The Truly Random Number Generator sends us to page 138. I’ve read Rowling’s two mystery novels written under the pseudonym Robert Galbraith and found them quite engaging; here’s hoping The Casual Vacancy passes muster. I gave All the Light We Cannot See by Anthony Doerr 5 stars. I found the subject and style of the book engaging; so engaging I finished the novel in under a day. The book even made it onto my “Books To Buy Even Though I’ve Already Read Them” list. In my opinion, it certainly lived up to the hype. Anansi Boys by Neil Gaiman earned 3 stars. The storyline was a tad obvious and the ending somewhat unsatisfactory. Billed by some as a “sequel” to American Gods, Anansi Boys has little – if anything – to do with its predecessor. John le Carré’s A Most Wanted Man scored 5 stars. A well-written suspense/thriller novel that had me guessing. I really enjoyed this book. I remember loving how so not Harry Potter it was, but still being able to hear J.K. Rowling’s writer voice as I was reading. And! I’m glad you enjoyed A Most Wanted Man; it’s not my favourite le Carre novel, but it’s still an excellent book. I was a bit disappointed in the ending, but I think it’s one of his that I need to read again. Yes, the ending was a letdown. I was tempted to pick this up at the library but got Aftermath by Rachel Cusk. Jesu christi, it was hard going and I have ditched it. Will pick this up when I return Aftermath. I’ve only read 13 pages so far, so I really can’t speak for its overall quality (yet).